Ranatunga, who captained the side that won the 1996 World Cup, doubted that Sri Lanka would even get past the first round of the tournament that begins in England on May 30. “There is corruption at the board. Players are demoralised. Players are fighting with each other,” said the 55-year-old. 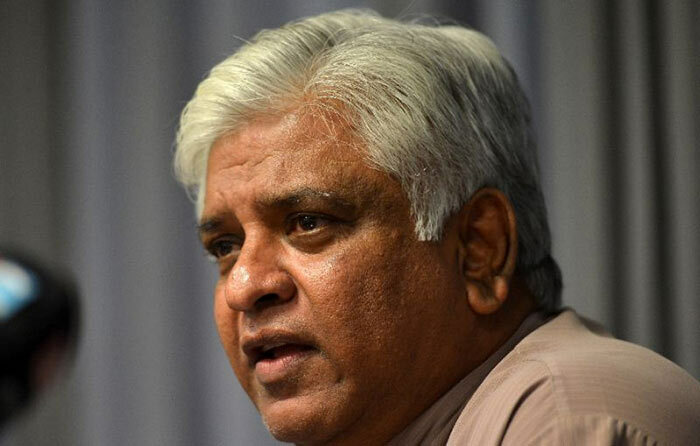 Ranatunga, who is currently Sri Lanka’s transport minister, is preparing a new bid to take charge of Sri Lanka Cricket. He told reporters in Colombo that the national cricket board and several unnamed players were responsible for the national team’s recent poor performances. Sri Lanka, who are currently touring Australia, lost the first Test by an innings and 40 runs after losing a two-Test series to New Zealand 1-0. Sri Lanka also lost the three one-day internationals and the one-off T20 match. “We have to improve player discipline,” Ranatunga said amid social media squabbling between T20 captain Lasith Malinga and stand-in captain Tissara Perera. Sri Lanka Cricket has warned both players to quit the personal attacks but the outbursts continue. However, Ranatunga said Sri Lanka should be better motivated and psychologically prepared for the World Cup. He said he would contest board elections this month on a promise to turnaround the national team. The crisis-ridden governing body is expected to hold elections this month after a nine-month delay following the end of president Thilanga Sumathipala’s term last May. The SL cricket team is a disaster not heading for disastwe. They seem give yp the advatage by droppung catches , poor fielding and very ordinary batting. Is is embarrasing the way they are playing cricket at rhe moment. Don’t see any improvement in the near future. What a shame. Sri Lanka is kissing the dust. But there is a good thing. That is SL can’t go down anymore. Only possibility is going up. When? Only God knows. BTW Pirith Tread (Nool) and some SL cricketers signing cross before facing bawls do not have any effect. We brought Hathuru and now he has become ‘Kathuru’ . Ashly Silva now collecting ash, Better not to play WC. Withdraw from it and send SL woman team and at least they will score runs! Shame…Shame SL national team. 3rd day in Canberra and only thing SL have done is to strengthen to Aussies; down and out Starc – 5 wickets and Usman – 101. The SL Sprts Minister, Google Balloon Fernando and his entourage of 24 catchers have been leading high life in a luxury hotel in Canberra at the expense of our amude wearing taxpayers for 4 days so far; they came to Canberra to encourage the SL team; what a disaster. Thilanga has refused to head SL Cricket and he has also been banned by ICC as he is a bookmaker. Only hope at World Cup is to bring Arjuna to head SL Cricket, send Hauhuru the kathuru to where he came from and drop the clueless Google Balloon Fernando, the Sports Minister and handover the portfolio to Trade Minister Maliki who was an excellent Royal Rugby Player in his youth. 4th day in Canberra; I am actually ashamed of being a SL cricket fan. The SL batsmen didn’t have a clue of how to face the Aussie attack. Shame, the ‘Kathuru’ was shown on TV with downcast eyes hidden by expensive sunglasses. Google Balloon Fernando, the Sports Minister, and his 24 catchers, having led the high life, left Canberra to Colombo to celebrate National Day where 1982 model MIG jets which made some people super rich are displayed. What a shameful test match and test series. Sack the Minister, Google Balloon Fernando. Appoint Maliki, super rugby player in his days at Royal College, Colombo, as Sports Minister. Arjuna will be SL Cricket head. SL team will be on track for the 2023 World Cup.